Is India ready to face the silent disaster? The ongoing showers have possibly brought reprieve to large parts of North-West and Central India, that were under the grips of the heat wave until recently, but the fatal heat waves are likely to come back with more frequency and intensity. An increase in temperature, heightened by unchecked global warming, exposed millions of Indians to the dangers of extreme heat, the northern and central parts being the most vulnerable . The increase in atmospheric humidity prevents perspiration, our natural defense against extreme heat, making us feel hotter than what the temperature reflects. The breaks in hot spells and night time drop in temperatures are two critical factors that allow for cooling and recuperation. However, humans will have less time and scope to recover as future heat waves are projected to be more sustained and cause higher night-time temperatures. Night-time temperatures are projected to remain above our comfort level for periods of three to five months periods by 2020-40. Bihar, for example, experienced more than 15 days of 40+ degree Celsius temperature in 2018, resulting in heat waves. A large proportion of our population is highly vulnerable to heat waves due to the possession of fewer household amenities as well as lower rates of literacy and access to water and sanitation. In India, heat-wave caused 22,562 deaths between 1992 and 2015, five times the death toll from Hurricane Katrina that was hailed as a major, global-scale disaster. Apart from the high mortality rates observed, heat wave severely impacts our well-being. Aptly called a “silent disaster,” it has developed gradually and led to serious health concerns for humans, crops as well as livestock. To add to these concerns, under the 2 oC warming scenario (IPCC AR5), the frequency of heat waves in India is projected to increase by 30 times the current frequency by the end of the century. The duration of heat waves is also expected to increase 92 to 200-fold under 1.5 and 2oC scenarios. This means that by the end of the century, heat waves such as the one that occurred in 1989, one of the most severe to date, will occur every year. This coupled with the fact that 0.5 degree rise in temperature leads to a 146 per cent increase in the probability of heat-related deaths makes this situation particularly alarming. Are the mitigation measures enough? The global community has taken several mitigation and adaptation measures to address this issue. The Paris Agreement was a landmark treaty that paved the way for keeping the global temperature increase well below 2 °C and ideally limit it to 1.5 °C. At the national and sub-national level, many adaptation measures have also been identified and implemented. These include improvements in physical, social and communication infrastructure (to increase awareness), heat warnings systems, green roofs and reflective roofs, and consideration of heat in planning and development policies. Many low-cost solutions to cope with the heat challenge exist and have been successfully deployed in parts of India, though not nearly at the scale needed to cope with the magnitude of the challenge ahead. For instance, Ahmedabad has developed a successful heat action plan that triggers response measures such as distribution of free water, closure of schools and closure of government work programmes when the temperature reaches 45 degrees Celsius. Emergency response measures have been complemented with training of hospital staff to identify and respond to heat stroke, and painting of roofs with reflective paint, that can cut temperatures in homes by up to 5°C. Initial estimates suggest that these measures have saved close to 800 lives since the action plan was put into place in 2013. If India wants to meet its goal of zero heat related mortality, it needs to adopt more system-driven and multi-layered approach. This comprehensive approach would require national and state level approaches, public private partnerships, and technical innovation. Meanwhile, there are certainly areas where more research and innovation areneeded, such as development of low cost, low (or no) energy cooling systems, low cost reflective paints, experimentation on how to reduce impact of heat on crops and livestock and the scale up of green building techniques that can regulate temperature effectively. The need of the hour is to leverage public-private partnerships to develop innovative solutions, such as mapping urban heat island effects through drone technology. 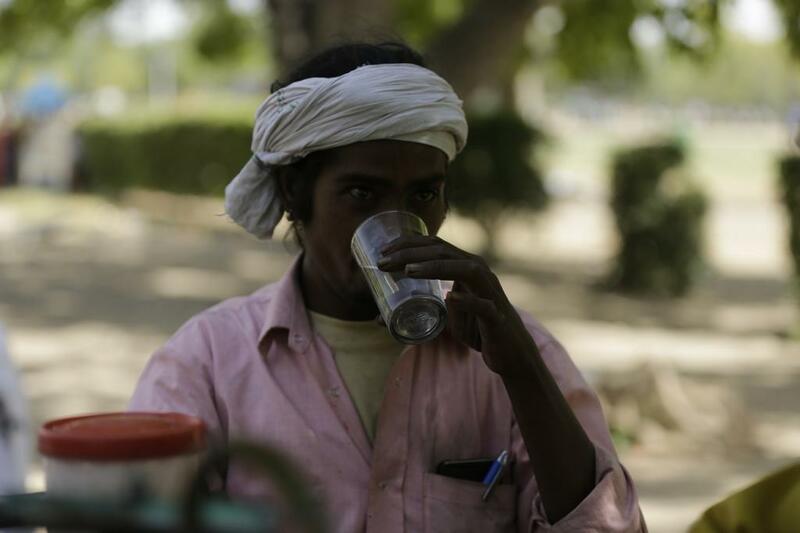 The impact of heat waves is highest on poor and marginal communities and therefore bottom-up measures are needed. This said, tackling the broader problem of climate change induced rise in temperatures requires a comprehensive set of top-down guidelines and policies. In this context, the National Disaster Management Authority has launched a proactive awareness public awareness campaign and is assisting state governments to prepare respective Heat Action Plans. The mandate to address the issue falls under different ministries and departments both at the national, state and local level. Therefore, discussions to create a coordination mechanism, that will ease implementation, is now imperative. At the state level, more effort is needed in developing and implementing heat action plans particularly in most vulnerable states (Odisha, Maharashtra, Bihar and other parts of central-western India identified as primary hotspots in a 2017 World Bank report) and putting heat warnings into use. This would necessarily include a special focus on issues of gender, social inclusion, children, the elderly and disabled in managing heat risks, as these sections of the population are often the most vulnerable to heat mortality. The execution of these plans will require investment, commitment and coordination from each sector, community group, and local, state and national government agencies. It’s time that India faces this silent threat. (The author manages the Indian operations of the Action on Climate Today, an initiative by the UK Department for International Development to reduce the effects of climate change in South Asia. It is managed by Oxford Policy Management).